This tasty, golden syrup is sure to become an annual treat. 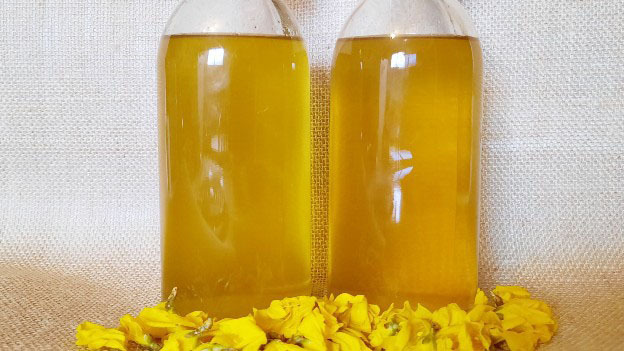 The beauty of forsythia flowers is transformed into a delectable syrup you can enjoy on pancakes or use as a base to make forsythia juice. Add water and sugar into a medium saucepan. Bring to a boil over high heat, stirring constantly until the sugar dissolves. Boil for 1 minute and then remove from heat. Rinse forsythia flowers under cool water (drip dry); add to the syrup, stir to coat, cover and let steep overnight. In the morning, strain the syrup through a very fine sieve lined with two layers of damp cheesecloth. Store in bottles or jars (be sure to sterilize for maximum storage time) and refrigerate for up to 3 months.